The 2007 Winter Meetings are here and believe it or not—and based on all my ranting, it may be hard to believe—there are people other than Johan Santana on the trade market. So I’m going to use this bloggity-blog to focus on some teams that are expected to be—or at least should be—very active at the Winter Meetings. The Dodgers have been sitting on their hands most of this off-season since signing Joe Torre to man the helm. They have numerous weaknesses to address, but as has become status quo, they simply aren’t addressing any of them. They are in talks with the Marlins for third-baseman/left-fielder/future first-baseman/future DH/future pie-eating champion Miguel Cabrera, but all of those trade talks seem to have cooled immensely in recent weeks. 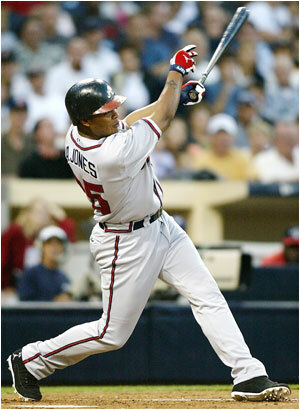 With the team still in need of a serious power threat, all eyes may be on free-agent centerfield Andruw Jones this week. Jones is coming off the worst season of his career — .222 average, 26 homers, 96 RBIs. Even with those numbers, Jones would immediately become the most potent proven bat in the Dodgers lineup. He could command a very large, long-term deal and given the Dodgers desperate need for not only a defensive upgrade in centerfield, but some serious power in the line-up, he may be worth every penny—to the Dodgers that is. The Dodgers, initially thought to be involved in the Santana talks, are also keeping an eye on the availability of solid pitching options. Randy Wolf—one of the team’s best starters before injury shut him down in July—recently signed with the rival San Diego Padres, Jason Schmidt is a bit of a question mark after going under the knife last season. Clayton Kershaw—one of the team’s top bargaining chips at the trade table—may or may not be ready for the show next season. That leaves a rotation Derrek Lowe, Brad Penny, Chad Billingsley and Esteban Loaiza. Needless to say, adding another starter might not be such a bad idea. The free agent class of pitcher is at best, uninspiring, but Livan Hernandez or Carlos Silva, slotted in the five-hole in the rotation could be highly-effective. Also available is a glut of pitchers returning from injury such as Freddy Garcia, Matt Clement and 2005 Cy Young Award winner Bartolo Colon. All come with the high risk, high reward tag attached. The Mets are in dire need of a front-line starter. A stopper, if you will. They need someone whose name on the lineup means a day off for the bullpen and the end of a losing streak. Right now they don’t have it. In fact, after losing Tom Glavine back to the division-rival Atlanta Braves they now have even less depth. The opening day rotation right now looks like Pedro Martinez, Orlando Hernandez, Oliver Perez, John Maine and either Philip Humber or Mike Pelfrey. Needless to say, that rotation doesn’t exactly intimidate the rest of the NL East…or most city league softball teams. General Manager Omar Minaya will clearly be on the prowl to add a starter (or two) at the Winter Meetings and given the poor showings of Pelfrey and Humber in their major league debuts last season, may be willing to dangle both of them in trade talks. 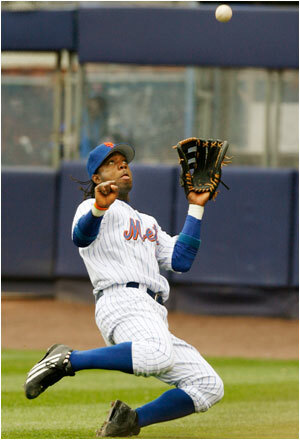 He may, however, have lost himself a major bargaining chip when he jettisoned mercurial outfielder and long-time “can’t miss” prospect Lastings Milledge to the Nationals for two-second tier complimentary parts in catcher Brian Schneider and outfielder Ryan Church. In essence the Mets have lost out in the Santana race, due to a lack of suitable prospects. Although once Santana has been moved names like Erik Bedard, Dan Haren, Joe Blanton and Dontrelle Willis could all become available on the trade market. As well teams such as the Giants, Angels and Dodgers could be willing to move one of their starters for the right price. Any package the Mets would offer would have to include one of their young outfielder Carlos Gomez or Fernando Martinez and probably one of the top three pitching prospects in either Pelfrey, Humber or Kevin Mulvey. 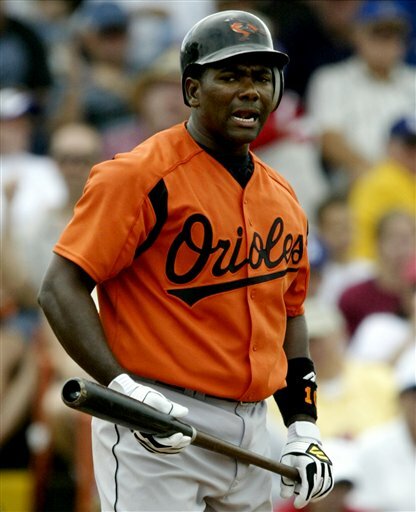 However, one thing the team seems to be overlooking is how badly some of these teams out west are in need of slugger; a need that could be filled by trading Carlos Delgado and a prospect. The Angels could send back Ervin Santana or Joe Saunders. The Giants could be willing to part with Tim Lincecum. The Dodgers, although relatively light on pitching themselves, may be willing to ship out Billingsley and/or Kershaw if given the right return from the Mets. I know, I know…there hasn’t been much talk of movement on the part of the Brew-Crew, but hear me out. The team is in dire need of a makeover for the backend of the bullpen given the exoduses of Francisco Cordero and Scott Linebrink. The thought of giving Derrick Turnbow the reigns as the full-time closer again, is a little scary. However, so is gambling on someone such as free-agent Eric Gagne to return to form following his implosion in Boston. In addition, the team may want to start thinking about Ben Sheets’ future with the club. He is a free-agent after the 2008 season and given the ridiculous inflation of prices for free-agent pitchers, he might be more valuable in a trade once the Santana/Haren/Bedard-hoopla has died down. If not for the numerous injuries that have hampered the fireballer’s career thus far, he could be the most attractive option on the market. If the Brewers ever though about trading Sheets, this off-season is the time to act. He could command a solid return from any of a number of clubs who miss out on Santana and he wouldn’t come at nearly as steep a price to re-sign. At the same time, the rotation behind Sheets looks to be pretty solid, albeit quite young in most respects. The Brewers are a team on the cusp of perennial contention and flipping Sheet this offseason, say to the Mets for Heilman and one or two of their prospects could turn out to be a huge return. My advice, don’t count the Brewers out as players at the Winter Meetings. The Angels already fired their first salvo of the off-season when they traded away Gold Glover shortstop Orlando Cabrera to the White Sox for start Jon Garland. Then in the wee-hours of the morning on Thanksgiving, the Halos snared Torii Hunter with a 5-year/$90 million deal. With those moves already done, the Angels next mission is to acquire a slugger to stick behind Vladimir Guerrero in the lineup. The most attractive options to the Angels appear to be a pair of dudes named Miguel; those Miguels being Cabrera and Tejada respectively. Cabrera—as mentioned in the Dodgers portion—is the slugging third-sacker for the Florida Marlins and will probably require a larger return from whichever club he is moved to than would Tejada, the current shortstop for the Orioles. Reports suggest that the Orioles’ president of baseball operations, Andy McPhail, is so unhappy with the product on the field that he may be willing to ship out his bigger names, such as Tejada, Melvin Mora, Brian Roberts, Ramon Hernandez and even ace Erik Bedard, for a lower cost of big-league talent and more prospects. If the Angels acquire either Miguel, expect him to be entrenched at the thirdbase and in the four hole, behind Guerrero in the lineup. Rumor currently has the Marlins asking for way too much from the Angels. If that’s the case Tejada becomes the top option and the club can contemplate diving into the market for one of the top pitchers that may be available via trade. Either way, don’t expect the Angels to sit idly by with the moves they’ve already made. New GM Tony Reagins has proven to be very proactive and is definitely looking to make the Angels a favorite in the 2008…thus far, he’s on the right path. After collapsing in the first-round of the playoffs and with the younger Steinbrenners now at the helm, the Yankees appear very, very motivated to improve their club for next season. The team has already been very active bringing back key members of the 2007 squad including: Alex Rodriguez, Jorge Posada, Mariano Rivera and Andy Pettitte. On top of that the club has been in hot-pursuit of Twins’ ace Johan Santana and whether they win the Santana Sweepstakes or not, the Yankees still would have to consider the possibility of making a move if Haren or Bedard were to become available. Depending on the outcome of the Santana-deal, the Yankees may also be in the market to acquire a new centerfielder if Melky Cabrera is traded. Options include free-agents such as Aaron Rowand and Andruw Jones, both of whom would be great additions defensively, but will probably require more money and more of a long-term commitment than the team is willing to give. That makes second-tier free agents such as Mike Cameron and Corey Patterson all the more attractive as short-term solutions. At this point Johnny Damon shouldn’t even be considered as a full-time centerfielder. 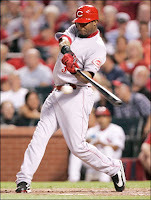 Other options on the trade market could include Ken Griffey Jr. from the Reds. He is entering the final season of his contract and has long talked about a desire to win a World Series. The Yankees offer that opportunity year-in-and-year-out and Griffey’s sweet swing would look really nice with that short porch in right field. If the team was merely looking for a short-term replacement, the Red Sox Coco Crisp (again, based on the outcome of the Santana trade) may or may not be available. Although I can’t foresee a trade being worked out between these two clubs. The Yankees may or may not be ballsy enough to go ahead and inquire about the Braves’ Mark Texeira. Tex is a free agent after the 2008 season and isn’t expected to sign an extension. If the Yankees could pull the right strings, they may be able to trade for and then sign the switch-hitting slugger (who can also play some defense); a move which would substantially bolster the Yanks offense and would set up a pretty solid combo of A-Rod and Tex at the heart of the Yankees lineup. All-in-all this year’s Winter Meetings appear to be ripe for trades as opposed to teams simply throwing their money at free-agents as has been the case in recent years. Expect a lot of rumors, a lot of big stories and when it’s all said and done…expect a very exciting season in 2008, with lots of big names in new homes.